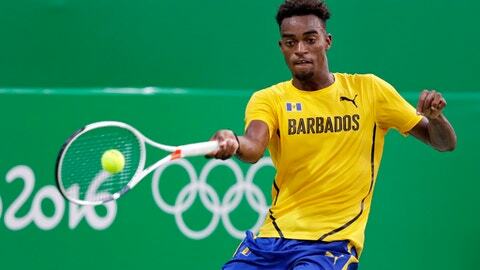 MEMPHIS, Tenn. (AP) Darian King, a qualifier from Barbados, knocked off No. 5 seed Bernard Tomic 6-4, 6-4 on Tuesday in the first round of the Memphis Open. King, ranked 140th in the world, dropped just 12 points in 10 service games and never faced a break-point situation against the 32nd-ranked Tomic. Other first-round winners Tuesday included No. 7 seed Steve Darcis of Belgium, Ryan Harrison of the United States and Matthew Ebden of Australia. Harrison won 6-3. 7-5 over Russia’s Konstantin Kravchuk to advance to a second-round matchup with No. 3 seed Sam Querrey. Darcis won 7-5, 3-6, 6-4 over Radu Albot of Moldova. Ebden rallied from a break down in each of the last two sets to beat Canada’s Peter Polansky 6-7 (4), 6-3, 6-1 in a matchup between two qualifiers. Ebden won the last six games of a match that featured a total of 14 service breaks.